Mesh Wi-Fi systems offer solid Wi-Fi coverage throughout large areas that a single router can’t cover. But every manufacturer has its own mesh Wi-Fi system, and they can’t communicate with each other. 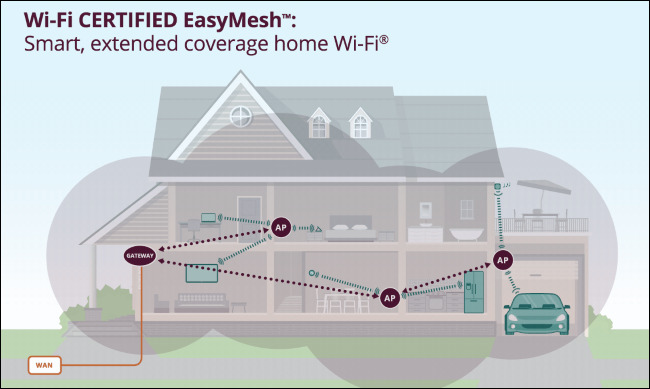 That’s where the new “Wi-Fi EasyMesh” standard comes in. Don’t get too excited, though. No manufacturers have actually signed on to use this standard yet. Eero, Google, Linksys, Netgear, and D-Link all like their own proprietary systems. Unlimited gaming in full HD. A standard Wi-Fi router has only a limited range. If you have a large home or business, or if you want to extend your Wi-Fi outside, you need additional pieces of hardware. Traditionally, people used Wi-Fi extenders for this. But Wi-Fi extenders can be a bit complicated to set up, and they sometimes require creating new Wi-Fi network names, known as SSIDs, for the extended network. Yes, you can do that by configuring your various access points to use the same SSID (if they allow you to), but it doesn’t always work well. Mesh Wi-Fi systems are similar to using a router and one or more Wi-Fi extenders, but they’re easier to set up. All you have to do is plug in several of the mesh Wi-Fi units throughout the area and go through a few quick steps in the accompanying smartphone app. The mesh Wi-Fi devices create a Wi-Fi network and communicate with each other. You’ll appear to have a single Wi-Fi network with a single name, but devices automatically connect to the best access point. If you need to extend your Wi-Fi network even further, just buy another mesh Wi-Fi unit from the same manufacturer and join it to your mesh network. In other words, mesh Wi-Fi systems offer a much simpler way to set up a Wi-Fi network that would normally require multiple wireless routers, or a wireless router and one or more Wi-Fi extenders. There are many different mesh Wi-Fi systems from different manufacturers, including the Eero, Google WiFi, Linksys VELOP, Netgear Orbi, and D-link Covr.